Colour is a sensation and as such it is a subjective and incommunicable quantity. Colour measurement is possible because we can create a correspondence between colour sensations and the light radiations that stimulate them. This correspondence concerns the physics of light radiation, the physiology of the visual process and the psychology of vision. Historically, in parallel to standard colorimetry, systems for colour ordering have been developed that allow colour specifications in a very practical and concrete way, based on the direct vision of material colour samples arranged in colour atlases. Colour-ordering systems are sources of knowledge of colour vision, which integrate standard colorimetry. 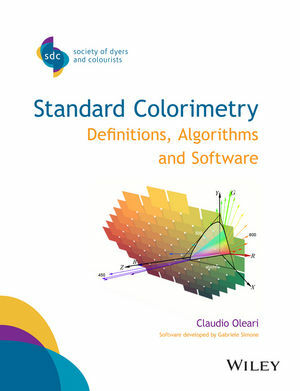 Standard Colorimetry: Definitions, Algorithms and Software is an accessible and valuable resource for students, lecturers, researchers and laboratory technicians in colour science and image technology. Professor Claudio Oleari received a doctorate in physics from Padua University in 1969. His scientific activity after 1986 is dedicated to Vision Science and Colorimetry. He is visiting professor at Granada University and is a member of the Italian Society of Optics and Photonics. Oleari is the author of more than 100 papers, generally signed as the single author, and he is editor and co-author of the only Italian text book on colorimetry and color science, "Misurare il colore". Oleari is now Associate Professor of Physics at the University of Parma where he teaches coliometry, biophysics, physical optics, physics and applied physics at graduate and postgraduate levels. Gabriele Simone received his BiT in 2005 and his MSIT in 2007 both at University of Milan-Department of Information Technology, Italy. He is currently pursuing a PhD in Color Imaging. He is a member of the Norwegian Colour and Visual Computing Laboratory at Gjøvik University College and his main research topic is contrast measure, image difference metrics, and tone mapping algorithms in HDR images. Today is working as Application Development Engineer at STMicroelectronics APG-M&RF Division-Infotainment BU.